During and after treatment for breast cancer, I had plenty of trouble sleeping – hot flashes, worrying, discomfort from my chemo port and breast tissue expander prevented peaceful sleep. When I consulted my oncologist about sleep, he suggested that I try melatonin. Since I could get it without a prescription, I gave it a try. Six years later, I'm still taking melatonin to promote sleep, but now I've learned that it can actually slow the growth of some kinds of breast cancer, and might help prevent low platelet counts. While it isn't for everybody, you might benefit in many ways from using melatonin. Your body creates its own melatonin, a hormone, to help regulate other hormones and your 24-hour internal body clock - your circadian rhythm. Ever wonder why staying up late and flying across time zones breaks up your sleep patterns? The extra exposure to light throws off your body clock, and prevents your brain from making enough melatonin to help you get the right amount of sleep. Deep within your brain, there is a very light-sensitive organ called the pineal gland. Your pineal gland is a very small, pine-cone shaped bump right in front of your cerebellum. This gland receives information about your environmental light situation from the retinas in your eyes, and is sometimes referred to as the "third eye." It doesn't matter whether you're getting light during the day or night, your pineal gland never stops checking your light exposure levels. The more darkness your eyes receive, the more melatonin is produced. Circumstances that expose you to light for much of the 24-hour cycle, such as working the night shift, sleeping near a constant light source, or having poor vision, can dramatically lower your melatonin levels. Melatonin levels control your estrogen, progesterone, and testosterone amounts, which in turn signal your menses and affect the start of menopause. Your aging process and immune system may also be affected by melatonin, due to changing sleep patterns and the antioxidant effects of this hormone. For those of us with estrogen-fueled breast cancer, taking a hormone, even melatonin, is something to be discussed with your doctor first. Melatonin has been shown to act as an anti-estrogen and a suppressor of estradiol. Because melatonin can reduce your levels of circulating estrogen, it can slow down the growth of breast tumors, and may reduce the incidence of breast cancer. However, more research is needed. Some preliminary lab studies show that melatonin may enhance the effects of some of the chemotherapy drugs that are used to treat breast cancer. In a small study, women whose tumors did not respond well to tamoxifen took melatonin as a supplement, and 28% of the study group had some shrinkage of tumors. A different kind of benefit in relation to breast cancer treatment was found in a different small study – when patients were given melatonin 7 days prior to chemo, their platelet levels remained healthy, preventing thrombocytopenia. While everyone will need different amounts of melatonin to get a good night's sleep, my doctor suggested that I start with just one nightly 3 mg pill for a week, and if that didn't help, use two 3 mg pills, taken either at, or one hour before, bedtime. Taking the lowest possible amount that is effective prevents side effects, such as fatigue or irritability. 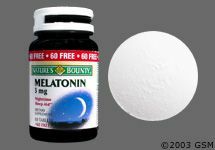 Melatonin is also available combined with Theanine (from green tea) and Vitamin B6, for stress-reducing sleep support. If you're having trouble sleeping while taking treatment for breast cancer, or even after you've completed treatment, discuss this with your doctor. If you don't like the idea of taking yet more prescription drugs, ask your oncologist if melatonin is safe for you. If it is, take a warm tub soak, spray some lavender oil on your pillowcase, dim the lights, and take a melatonin. It may benefit your sleep and health in many ways. Because melatonin is not regulated by the FDA, the quality of the product can vary. Be sure to buy from a trusted source. Emilio J. Sánchez-Barceló, Samuel Cos, Dolores Mediavilla, Carlos Martínez-Campa, Alicia González, Carolina Alonso-González (2005). Melatonin-estrogen interactions in breast cancer. Journal of Pineal Research 38 (4), 217-222, 2004. Estrogen-signaling pathway: A link between breast cancer and melatonin oncostatic actions. Cancer Detection and Prevention, Volume 30, Issue 2, Pages 118 - 128, 2006. S. Cos, A. González, C. Martínez-Campa , M. Mediavilla , C. Alonso-González , E. Sánchez-Barceló. Lissoni P, Tancini G, Paolorossi F, Mandala M, Ardizzoia A, Malugani F, et al. Chemoneuroendocrine therapy of metastatic breast cancer with persistent thrombocytopenia with weekly low-dose epirubicin plus melatonin: a phase II study. J Pineal Res . 1999;26(3):169-173. Schernhammer E, Hankinson S. Urinary melatonin levels and breast cancer risk. J Nat Canc Instit 2005;97(14):1084-1087. University of Maryland Medical Center. Medical Reference - Complementary Medicine - Melatonin. Review Date: 10/17/2005.